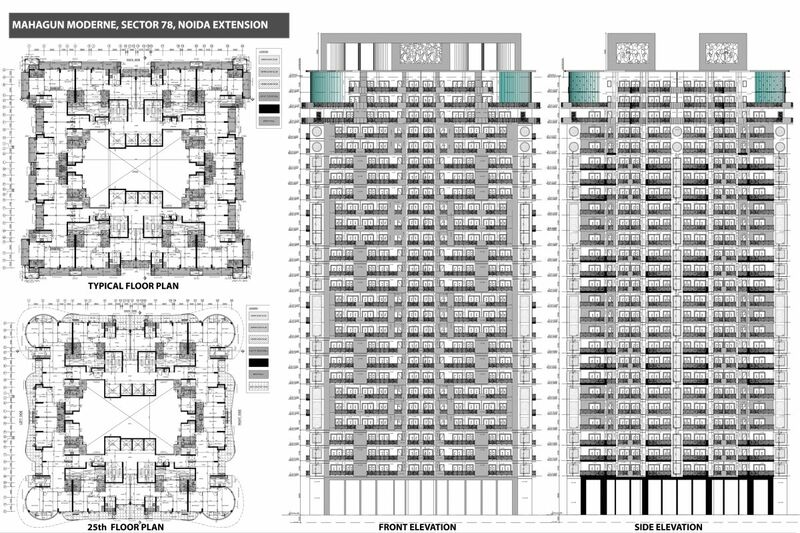 Mahagun Moderne at NOIDA, by GPMA - ArchitectureLive! Awarded as ‘Environment friendly project – residential’ at the Realty Plus Excellence Awards and the ‘Integrated Township of North’ at the Estate Summit & Awards, Mahagun Moderne is a perfect amalgamation of avant-garde architecture and modern day technology. Located in sector-78, Noida, it is an upmarket residence in Noida that enjoys good connectivity to prominent locations of the city. It is in close proximity to the commercial hub of sector-18, Noida and the Noida City Centre metro station and is well connected to NH 24 and Yamuna Expressway. The brief of the project was to deliver a luxurious lifestyle to the end-user with unique timeless signature style and impeccable craftsmanship. The implemented design creates intricate community spaces incorporating essential amenities for a healthy living. It houses a fully equipped clubhouse, swimming pool and spaces for sports activities. 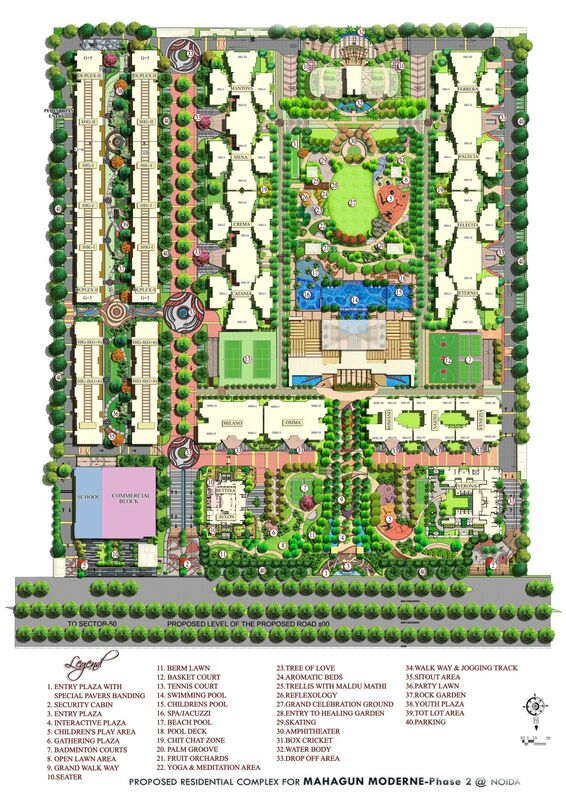 The master plan is spread across an area of 25 acres of land, involving a development of approx. 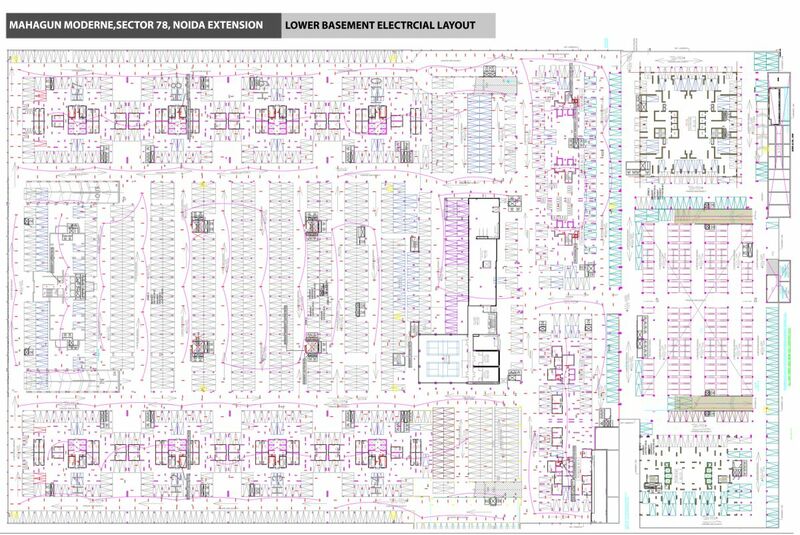 2700 units. The project offers a product mix of 2, 3 and 4 BHK apartments comprising of high rise apartments, duplex apartments, independent floors and penthouses for every kind of end-user. An iconic tower Marvella is dedicated to luxurious 5BHK units. The designs morphology has evolved from the traditional concept and well-knit transition within the functional spaces. The transition from public spaces to semi-private and private is premeditated at both macro and micro level. An inviting avenue leads the residents to a central roundabout which acts as a circulation indicator as well as an amphitheater. This which functions as a focal point of the overall project and emphasises the importance of social spaces. A network of streets leads from the peripheral vehicular road to the central greens. The streets act as spill-over spaces for the residents. The residential units are extensions of the central linear green space that works as a community space for residents of all age groups. The plots are aligned on the East-West axis ensuring maximum daylight in all habitable areas. Residential units are positioned to enhance cross ventilation which in turn reduces dependency on the HVAC system. The Wall window ration and orientation of the built form amplify natural daylighting. Phase 1 of the project includes Ground + 4 story structure. The low-rise building blocks minimize the structural cost adding to the cost-effectiveness. The elevation is designed with pergolas jails and other shading devices over fenestrations that complement the façade holistically and are highly cost effective and renders a distinct character to the project. Juxtaposed volumes create intricate shadow effects and also increase airflow, in turn, bringing about the cooling effect at a macro level. The flamboyant landscape design accommodates both soft and hard landscaping with gazebos, level changing mounds, Meditation Park, lush green lawns and an aquatic garden. A badminton court, jogging track, basketball court, skating ring are integrated with the landscape design. The development is planned to ensure maximum efficiency of workflow and quality control. Measures are taken to minimize air pollution during and post construction phases to attain zero discharge within the complex. Post construction waste management techniques have also been planned. The use of locally available materials adds to the cost effectiveness. Parking spaces are soft paved to maximize groundwater absorption and rainwater harvesting systems reduce the dependency on fresh water requirements. The runoff water of building terraces, paved areas and landscape areas are channelized to the rainwater harvesting structures which are designed as per the peak intensity of rainfall to suffice maximum surface runoff, avoiding flooding. Color coded waste disposal bins have been located at prominent locations in the complex. The biodegradable and non-biodegradable waste is planned to be collected and stored at earmarked places. This waste will further be sent to the disposal sites.